With year-round nearly perfect climate and unparalleled natural beauty, San Diego provides the perfect backdrop for rekindling the spirit and pampering the body. San Diego boasts a bevy of spas with top-of-the-line treatments, first-class services and indulgent amenities; these luxurious escapes can be found throughout the region nestled against the dramatic Pacific coastline, perched high above the glittering downtown skyline and set amidst the serenity of lush inland canyons. Following are some of the many spas in San Diego where guests can enjoy all inclusive family vacation, soothe their senses, inspire their soul, invigorate their step and energize their spirit. Overlooking the Pacific Ocean and adjacent to the 18th green of the famed Torrey Pines Golf Course, the Lodge at Torrey Pines in La Jolla is home to the Spa at Torrey Pines, which was ranked a “Four-Star” Spa by Forbes Magazine in 2013. Here, guests can sample a full-menu of therapeutic treatments utilizing marine and botanical-based products like the signature Coastal Sage Scrub that uses sage, an herb known for its purifying and detoxifying properties, in a Vichy shower. The Spa also offers Italian holistic and sensorial massages, body wraps, masks and specialty skin treatments. Located near the coastal cliffs of La Jolla, Estancia La Jolla Hotel & Spa boasts a sanctuary garden of eucalyptus, lavender and citrus trees, which create a peaceful environment to stimulate the senses. The Spa’s signature treatments include organic facials and botanical body treatments, and the Spa now boasts a couple’s bungalow complete with a private deck outfitted with a fireplace and soaking tub for two. Additional Spa amenities include an outdoor relaxation area, meditation garden, saltwater whirlpools and soothing eucalyptus steam rooms. Spa Aquazul in downtown’s Hilton San Diego Bayfront Hotel offers treatments emphasizing the healing properties of the sea. Its sanctuary-like setting revitalizes one’s mind and body through signature treatments like bubbling mud wraps, natural seaweed soaks and a wide range of massage therapies from around the world. Along with well-appointed treatment rooms, Spa Aquazul has a full-service nail salon, state-of-the-art health club, steam rooms, locker facilities, plush amenities and separate men’s and women’s relaxation areas. The Island Breeze Spa in the Sheraton San Diego Hotel & Marina on Harbor Island offers a full line of body treatments, facials, and manicure and pedicure treatments, customized for both men and women. The spa’s trained attendants can evaluate the needs of individual guests and customize a regimen of massage therapy, body wraps and cleansing treatments designed to make each client look and feel younger. Beginning in summer 2013, the Island Breeze Spa is offering single and couple massages in an outdoor pop-up cabana that overlooks glistening San Diego Bay. Blue Marble Spa in the Hyatt Regency Mission Bay Spa & Marina is an eco-friendly spa escape on tranquil Mission Bay. Designed with conservation in mind, it boasts sustainable architecture, products and practices. Treatments are based on the fundamental elements: earth, air, water and fire, and are available in 11 treatment spaces that include four individual treatment rooms, one wet treatment couple’s suite and five private outdoor spa cabanas. Other spa amenities include eucalyptus-infused steam rooms, rainfall showers, a manicure and pedicure lounge and waterfront fitness center. In June 2013, the Hilton San Diego Resort & Spa opened Mantra, nestled in a serene waterfront setting on Mission Bay. Treatments are inspired by techniques from around the world pand are designed to offer guests tranquility and optimal health and wellness. Mantra offers completely organic facials and body scrubs, and massage therapists are trained to take guests to a new level of relaxation. Guests can also enjoy Mantra’s salon services including hair design, makeup application, manicures and pedicures. The waterfront Catamaran Resort Hotel & Spa on Mission Bay boasts the South Seas-inspired Catamaran Spa. Offerings include a complete line of restorative treatments, including therapeutic and meditative massages, facials, body wraps, a Vichy shower, hydrotherapy and an outdoor whirlpool showcasing 360-degree views of picturesque Mission Bay. Open-air yoga classes are also offered on a secluded lawn beside the bay. The Spa in the Paradise Point Resort & Spa on Mission Bay offers treatments that incorporate exotic rituals from islands around the world and local San Diego influences. Guests can choose their sensory experience from Hawaii, Bali, Fiji, Thailand or the U.S. mainland, and experience signature treatments and services using techniques and ingredients indigenous to each location. Treatments range from a fresh pineapple scrub and hot stone facial to a bamboo massage and volcanic earth clay ritual. The 7,050-sq.ft. spa features eight treatment rooms, including an intimate bungalow for couple’s spa treatments, a movement studio, fitness classes, serene garden courtyard with private whirlpool, and plush 900-sq. ft. salon for hair, manicure and pedicure services. Located in the luxurious Hotel Palomar in downtown San Diego, Sè Spa offers a selection of massages and treatments based on cultural and aesthetic influences from around the world. The spa features seven personal treatment rooms, each with their own private steam shower, as well as a couple’s treatment suite and VIP lounge area. The Rock Spa in the Hard Rock Hotel San Diego, located in the heart of downtown’s historic Gaslamp Quarter, offers guests a relaxing place to recuperate and recover from their rock ‘n’ roll lifestyle. The spa features five treatment rooms, men’s and women’s steam rooms and a diverse menu of services. Signature treatments include the Dream Weaver Massage that fuses ylang ylang, bergamot and lavender oils with Swedish, Hawaiian and Thai massage techniques, and the Amped-Up Sugar Scrub that exfoliates the skin using natural ingredients like raw sugar and virgin coconut milk. The Kin Spa in downtown’s Manchester Grand Hyatt San Diego offers urban spa goers an outdoor oasis overlooking beautiful San Diego Bay. On the spa’s spacious rooftop pool deck, guests can soak in a whirlpool, lounge next to a lap pool and enjoy treatments in five private cabanas. Inside, guests can find 10 treatment rooms and a full roster of amenities, including his-and-her steam rooms, saunas and tranquil lounges. Located inland from the coastal communities of La Jolla and Del Mar, the Spa at Grand Del Mar in The Grand Del Mar resort is a lavish retreat that embraces the creative and rejuvenating spirit of the Renaissance. The Spa is ranked as one of the country’s top spas by Forbes Travel Guide, earning its prestigious “Five-Star” award since 2011. Featuring 11 indoor treatment rooms, guests can choose from an extensive list of massages, facials and hydrotherapy services. Signature treatments include the Renaissance body ritual that combines a mud wrap, aromatic oils, floating bed, Swiss shower and gentle touch therapy. Located north from downtown San Diego, the Serenity Spa and Salon at the Hilton Garden Inn San Diego-Del Mar offers an eclectic array of rejuvenating massages, relaxing nail treatments, soothing facials and body treatments, all using natural, chemical-free products. The full-service spa features five treatment rooms, men’s and women’s steam rooms, a relaxation room, exterior pool and Jacuzzi, workout room and a full-service hair salon. Bella Tosca Day Spa & Salon, located in the Town and Country Hotel in Mission Valley, offers skin care treatments like a healthy skin enzyme facial and pear and green apple body scrub. Guests can relax in the spa’s Jacuzzi, herbal steam room and cedar dry sauna. Happiness is calling in San Diego. 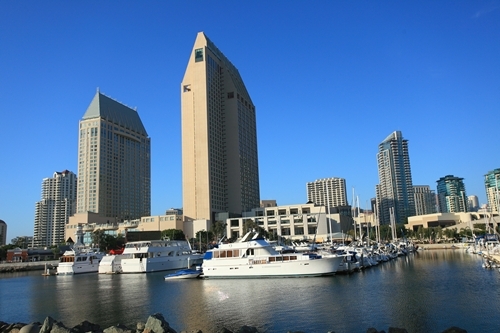 For more information on San Diego’s offerings, including exciting vacation packages and valuable coupons for attractions, restaurants and more, visit the San Diego Tourism Authority’s website at www.sandiego.org or call 619-236-1212.